National Grammar Day comes around again tomorrow (along with Opal Eleanor Armstrong Zwicky’s birthday, the 11th). To recognize the occasion, Dennis Baron has posted an entertaining piece (“Why is National Grammar Day different from all other days?”) on his blog. Here’s the beginning of the piece. Read the whole thing; it’s a hoot (“speak only with bitter verbs”!). 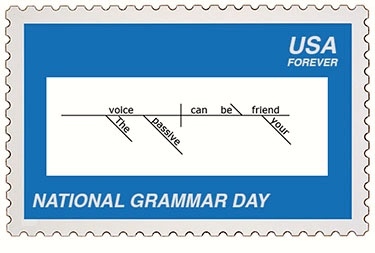 Today is National Grammar Day, otherwise known as the Feast of Purism. It is the holiest day of the Purist calendar. It is the day all foolish children ask, why is National Grammar Day different from all other days? On all other days you tell the foolish child, “It is different because I said so.” But on National Grammar Day, you must make everyone listen to yet another endless retelling of the story of our liberation from the tyranny of prescriptive grammar. On all other days, the day begins when we wake up. But National Grammar Day begins at sundown of the day before, which is called National Grammar Eve. On National Grammar Eve, we sit down to a special meal and eat our words. Pray that the Angel of Purism will pass over your house. This entry was posted on March 3, 2015 at 6:28 am and is filed under Grammar, Holidays, Humor. You can follow any responses to this entry through the RSS 2.0 feed. You can leave a response, or trackback from your own site.